We are delighted to confirm Gregor McGuckin and fellow competitor Abhilash Tomy are now onboard the French fisheries patrol vessel Osiris. The vessel initially rescued Indian sailor Abhilash Tomy who is reported to be conscious and talking. The vessel then sailed approximately 30 miles to safely evacuate Gregor McGuckin. McGuckin's condition is good and has reported nothing more than bumps and bruises. In an incredible show of seamanship, the 32-year-old Irishman managed to build a jury rig and hand steer his yacht Hanley Energy Endurance for the past four days to within 30 miles of his fellow competitor in order to be on site to assist with the rescue if required. McGuckin did not declare an emergency for his own situation despite being rolled over and losing his mast. However, given the extremely remote location and the condition of his yacht, it was deemed the appropriate course of action to abandon his yacht under a controlled evacuation scenario as the opportunity arose. The considered move ensures in the event that his own situation deteriorated in any attempt to reach land in the coming weeks a second rescue mission would not be required. Gregor McGuckin’s Team, friends and family would like to express their sincere gratitude to all involved in the operation so far. Our thoughts are now with Abhilash and his family. Wednesday, 15 August, marks Gregor McGuckin’s 32nd birthday. The solo sailor is now 45 days into what could be a 270 day non-stop voyage around the globe onboard his 36ft yacht Hanley Energy Endurance. McGuckin is currently making his way east in the South Atlantic, headed for the Cape of Good Hope, the first of the three great capes he will round as part of the Golden Globe Race. The race marks 50 years since the first successful solo non-stop circumnavigation by Sir Robin Knox-Johnston. Sir Robin was 28 years old when he set sail in 1969 and took 312 days to complete the race. The Golden Globe Race competitors are largely limited to the technology that was available when Sir Robin set sail, meaning no GPS, no watermakers, no weather routing and no modern forms of communication. McGuckin’s yacht, Hanley Energy Endurance, is older than he is, she was launched in 1984, two years before McGuckin was born. 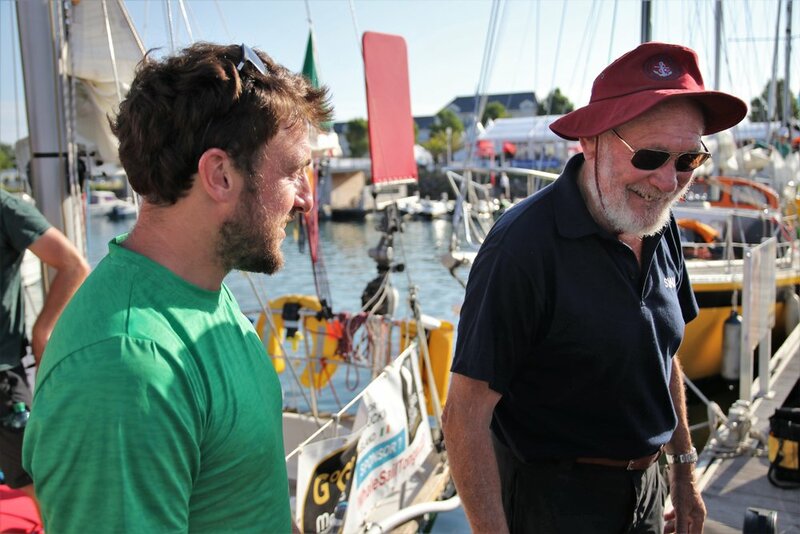 McGuckin is part of a new breed of Irish offshore solo sailors. His race is being supported by a number of Irish companies led by Hanley Energy, an award-winning data center solution innovator, headquartered in Ireland with many global operations. Anyone wishing to give a gift to Gregor, the GoFundMe page is still open to donations. With the start of the Golden Globe Race just 12 days away Gregor McGuckin Empowered by Hanley Energy have announced the support of Blackthorne International Transport. On 1 July McGuckin sets sail from Les Sables d’Olonne to compete in the gruelling Golden Globe Race that will see 18 solo sailors attempt to race alone, non-stop around the world without modern technology. If successful Gregor will be the first Irish person to complete this challenge. The race marks 50 years since Sir Robin Knox-Johnston was the first person to achieve what was once thought to be impossible. The 2018 edition of the race will see sailors navigate with the stars and the sun, catch rainwater to drink, and forgoes modern forms of communication such as internet. Visit www.gregormcguckin.com for more. One month to go until the start..